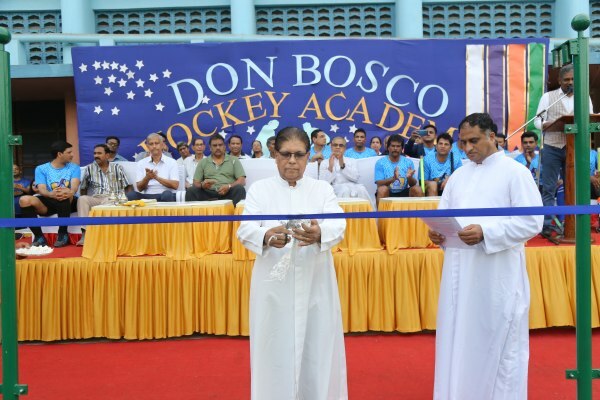 Don Bosco witnessed the inauguration of the newly constructed hockey turf on the campus, on Saturday, 30 March 2019, by the Provincial, Fr. Godfrey D’Souza , who was the chief guest for the opening . The turf was dedicated to Fr. Jude D’Mello, the late and former Rector of the school. It was blessed by the Provincial and the Management of the school. Hockey luminaries of the country, Principals of institutions, well wishers and young students were in attendance for the grand moment. The spectators revelled at the sight of the flood lit turf in all its glory. Fr. Godfrey D’Souza in his inaugural address observed, “This is a tonic to the sport. It’s a great initiative to revive the sport.” Dhanraj Pillay too addressed the spectators. He spoke about the importance of sports in a child’s life and also about the change in mindset of the people these days, i.e. sports is as important as academics and that sports can be looked at as a professional option. He amplified the importance of a healthy and a balanced diet for the young athletes because of the easy availability of fast food around them. The Rector, Fr. Crispino D’Souza, the chief architect of this project-along with his team of DB Matunga, Principal Fr. Bernard Fernandes and Administrator Fr. Roy Noronha-proposed the vote of thanks. 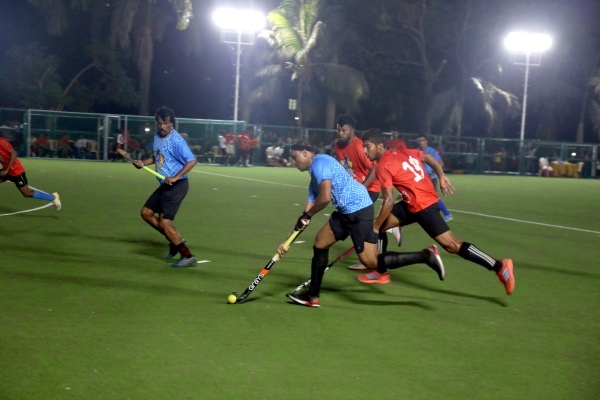 The star studded team comprising former Olympian hockey players took centre stage for an exhibition match against the past and present students of the school. Dhanraj Pillay, Adrian D’Souza, Gavin Ferreira, Clarence Lobo, Edgar Mascarenhas Sr, Edgar Mascarenhas Jr, Darryl D’Souza, Yuvraj Walmiki, Rahul Singh and Girish Pimpale made up the formidable line up. On the dais witnessing the proceedings were former hockey legends and mentors to Dhanraj Pillay and his colleagues. These included Joaquim Carvalho, M Somaya and Marcellus Gomes. The match kicked off with the dramatic countdown from the crowds. The spectators were treated to some stick wizardry by the hockey stalwarts. Yuvraj Walmiki, ex-Indian player and Girish Pimpale showed off their athleticism and wowed the crowd. 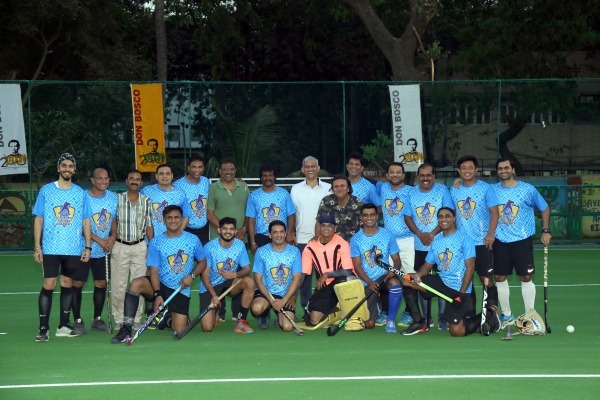 Girish was the goal hero for the veterans and Yuvraj Walmiki stood tall with his defense. For the Bosco Boys, Moses, an ex-student was the bright light as he soldiered on bravely and opened up chances to score, as they took on the veterans. Mihir Patil and Faizuddin were among the goal scorers for the Bosco team. Dhanraj Pillay, the former captain of the Indian National Hockey team and Padma Shree recipient regaled the spectators with a few tricks and also managed to perplex the Boscoites. The men in blue won the pulsating encounter 5-3 as their experience gave them an edge. The hockey fans and players got a glimpse of what it was like to play at the highest level against towering giants of the game. As the whistle blew signaling the close of match, young supporters and players raced towards Dhanraj Pillay and he obliged them with photographs and autographs. It was a historic moment in the annals of the school’s sporting history and a dream come true for hockey aficionados to rub shoulders with the hockey giants.